Bruce Kovner serves on the board of trustees and was formerly Chair of the American Enterprise Institute (AEI), a pro-coporate, right-wing think tank. Kovner also formerly served on the board of the Manhattan Institute and has provided financial backing for the New York Sun, a right-leaning newspaper, and The New Republic magazine under Martin Peretz. Through these organizations, Kovner was a major financial backer of right-wing infrastructure. Bruce Kovner and his wife, Suzie Kovner, are major contributors to Republican campaigns and causes in the United States. The Kovners are among the top out-of-state supporters of Wisconsin Governor Scott Walker, reporting contributions of $120,000 to his campaign during the 2011-2012 Wisconsin recall elections. In 2014 the Kovners were also revealed to have made a previously unknown $50,000 contribution during the recall to Wisconsin Club for Growth, which is a target of a long-running investigation into potentially illegal campaign coordination with Wisconsin Governor Scott Walker's electoral campaign. 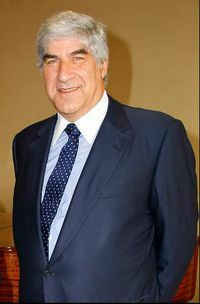 Kovner founded Caxton Corporation, a trading and hedge fund management company, in 1983, and served as chairman until he retired in 2011. As of May 2015, Forbes reports that Kovner has a net worth of $5 billion. On April 1, 2015, Kovner hosted a "meet and greet" fundraiser in New York City for Chris Christie's Leadership Matters for America PAC. Bruce Kovner and his wife, Suzie Kovner, have been among the top individual contributors to federal political campaigns in the United States. In 2012, the Kovners reported $1,924,100 in contributions to federal candidates, parties, political action committees, 527 organizations, and Carey committees, making them the 40th largest contributors in the country according to data compiled by the Center for Responsive Politics. 100 percent of their reported contributions went to Republican campaigns. [Id. at ¶¶ 54, 56; Exhibits 45, 47] A March 10, 2012 email Walker sent to Kate Doner stating that "Bruce and Suzie Kovner said they want to give more." On March 22, 2012, the WiCFG bank account reflected a deposit of $50,000 from the account of Bruce Kovner. The memo line of the check reflects the check is for "501c4-Walker." ↑ American Enterprise Institute, "Board of Trustees," organizational website, accessed May 2015. ↑ American Enterprise Institute, "Board of Trustees," November 2008. Archived by Internet Wayback Machine, accessed May 2015. ↑ 3.0 3.1 3.2 3.3 3.4 Institute for Policy Studies, Bruce Kovner Profile, Institute for Policy Studies, April 26, 2012. ↑ Phillip Weiss, George Soros’s Right-Wing Twin, New York Magazine, August 8, 2005. ↑ 5.0 5.1 Joe Hagan, "President Bush’s Neoconservatives Were Spawned Right Here in N.Y.C., New Home of the Right-Wing Gloat," New York Observer, Apil 28, 2003. ↑ 6.0 6.1 6.2 Center for Responsive Politics, "Top Individual Contributors: All Federal Contributions (2012)," Open Secrets database, accessed May 2015. ↑ 7.0 7.1 Wisconsin Democracy Campaign, "Bruce Kovner contributions, campaign finance database, accessed May 2015. ↑ 8.0 8.1 Wisconsin Democracy Campaign, "Suzie Kovner contributions, campaign finance database, accessed May 2015. ↑ Brendan Fischer," WI Club for Growth, Target of Walker Recall Probe, at Center of Dark Money Web," Center for Media and Democracy, PR Watch, November 18, 2013. ↑ Forbes, Bruce Kovner Profile, Forbes, 2015. ↑ Heather Haddon, Former Mitt Romney Donors to Turn Out for Chris Christie, Wall Street Journal, April 3, 2015. ↑ Center for Responsive Politics, "Bruce Kovner Contributions (2014 cycle)," Open Secrets database, accessed May 2015. ↑ Center for Responsive Politics, "Suzie Kovner Contributions (2014 cycle)," Open Secrets database, accessed May 2015. ↑ Center for Responsive Politics, "Bruce Kovner contributions (2012 election cycle)," Open Secrets database, accessed May 2015. ↑ 18.0 18.1 18.2 Synta Pharmaceuticals, Board of Directors, Synta Pharmaceuticals, 2015. ↑ Inside Philanthropy, Kovner Foundation: Grants for Music, Inside Philanthropy, 2015. ↑ Juilliard School, Leaders and Administration, Juilliard School, 2015. ↑ Lincoln Center, Board of Directors, Lincoln Center, 2015. ↑ The Metropolitan Opera, Board of Directors, The Metropolitan Opera, 2015. ↑ Council on Foreign Relations, Membership Roster, Council on Foreign Relations, 2015. ↑ National Affairs, About Us, National Affairs, 2015. ↑ Thomas B. Fordham Foundation, Board of Trustees, Thomas B. Fordham Foundation, 2015.